Is RFID in apparel finally coming of age? With apparel retailers and brands looking for new ways to bring down their buying-in prices, could now be the time for Radio Frequency Identification (RFID) to finally come into its own? Costs are coming down, suppliers are beginning to collaborate, and benefits could include better management in garment factories. With apparel retailers and brands looking for new ways to bring down their buying-in prices, could now be the time for Radio Frequency Identification (RFID) to finally come into its own? Mike Flanagan certainly thinks so, pointing out that costs are coming down, suppliers are beginning to collaborate, and benefits could include better management in garment factories. The state of the global economy is delaying the deployment of RFID item-level tagging in the retail sector, new research has found, with growth being driven by apparel firms. Merchandise and labelling solution provider Checkpoint Systems has unveiled a new system to simplify RFID tag number management for retailers. With the rapidly escalating use of RFID at all levels of the supply chain, there are literally hundreds of shapes and sizes of tags and readers - not to mention software and associated electronic systems - available on the market. RFID tags or transponders can be as small as a grain of rice or as large as a credit card, and readers likewise vary in capability, complexity and price. 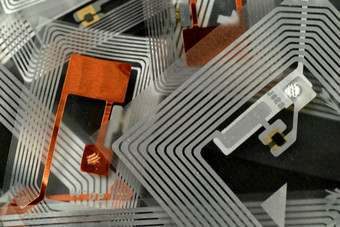 Privacy is the big bugbear for RFID tags. Sure they give retailers and manufacturers lots of excellent information, but there is a hint of Big Brother about how this automatic data collection. That's not good marketing. Networked clothing that can show you where it is at all times, talking to mirrors and shelves on the shop floor, is no longer the stuff of science fiction, but a reality developing rapidly in stores around the globe. Radio Frequency Identification (RFID) tagging is taking apparel retailing to a whole new level, with an uptake that shows no signs of slowing. Leading retailers, brands and suppliers - including The Jones Group, Macy's, Walmart, VF Corporation and Li & Fung - have joined an industry-wide push to drive the uptake of radio frequency identification (RFID) technology across the apparel supply chain. US retailer Wal-Mart has confirmed press reports that the company is to introduce electronic tags for individual garments in its stores. There has been an increase in item-level RFID adoption in the apparel industry as companies seek more accurate and efficient solutions from supply chain to point of purchase, an industry supplier has found.